What's even cooler than riding a cliff-hugging train at 10,000ft? Discovering a pack of vintage railroad motorcars and getting to climb on them! On the train we happened to sit next to a nice older couple from Nebraska who mentioned that they were in town to drive their motorcar--a retired RR maintenance machine--up the track with a bunch of other enthusiasts. We followed them off the train & got to clamber around their little ride! They told us to come back for the big gathering the next day, so we brought back Patrick & Charlie. 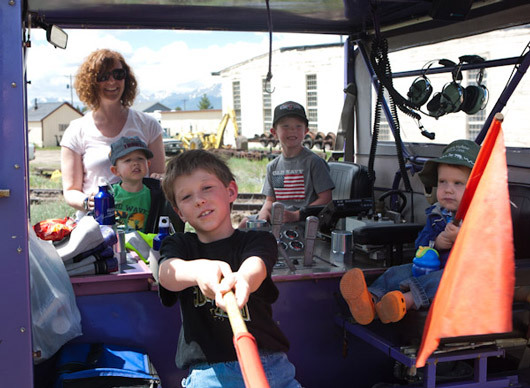 The drivers couldn't have been nicer to all the kids, and we even got to scramble around on a full-sized locomotive. Check out the gallery and little video!